Hello friends! How was your Thanksgiving? Are you feeling a little run down from the hustle and bustle of last week? I know I am moving pretty slowly this Monday morning. If you are looking for something easy and comforting for dinner tonight look no further because I have a perfect recipe for you. 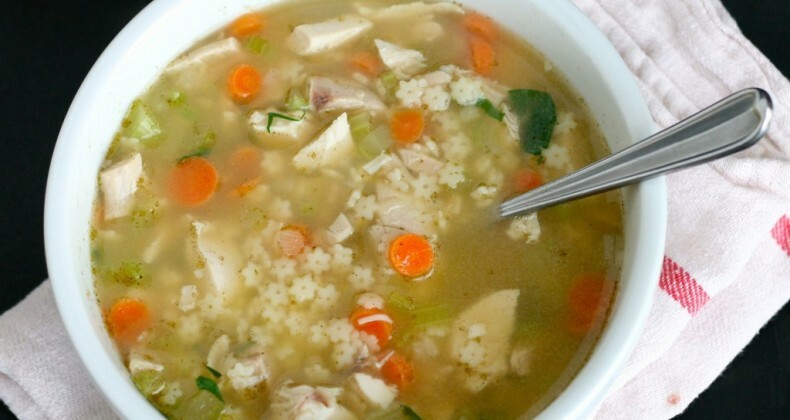 If you’re lucky enough to have leftover turkey it would be the perfect addition to this soup. Save some time by picking up a Rotisserie chicken at the grocery store. This soup warms the body and spirit when you are feeling run down. It is inspired by the chicken and stars soup from the can but tastes so much better. 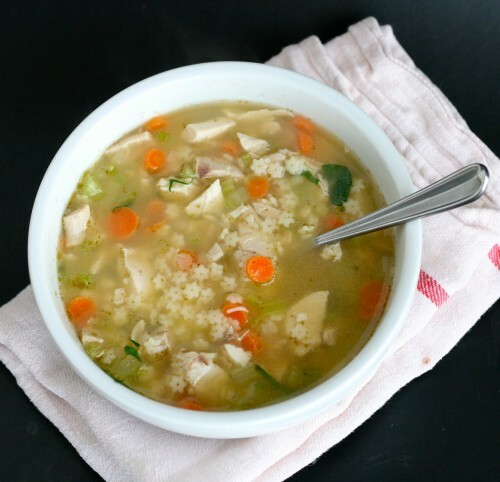 So as you are running around this month take a moment to recharge with a warm bowl of soup. If reheating the next day you may need to add more stock to get it to a soupy consistency. I don't mind a thicker soup on the second day though. In a large pot bring stock to boil on high. Add in poultry seasoning, bay leaf, celery, carrots, and onion. Boil for 5-7 minutes or until vegetables are at your desired tenderness. Add in cooked chicken or turkey. Stir in pasta and boil together for just a few minutes until everything is warmed through. Remove the bay leaf before serving. Garnish with chopped parsley. Hope you feel better soon Cate! Love how easy this soup seems to make, perfect for a lazy weeknight! Hope you’re well Jamie! Thanks Pamela! Just fighting my first cold of the season. Hopefully my sense of taste and smell will return quickly. Congratulations on your news!! Both are very exciting!! Havent seen your magazine in any of the checkout stands. Will have to stop by Barnes&Noble I guess. No cyber shopping for me. I used my leftover turkey in tetrazzinis for my daughter and us! YUM! Thank you Kath! Turkey tetrazzini sounds so good. It is something I used to make with I worked in the kitchen in college but I haven’t made it at home. I’ve added it to my list.